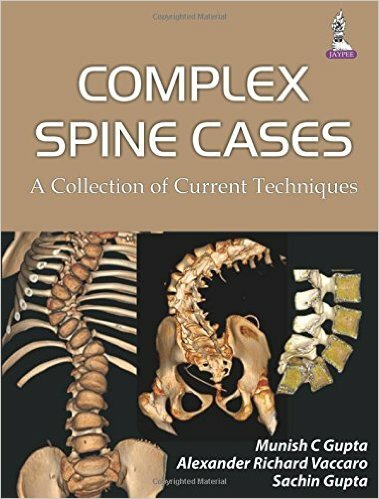 New Book on Spine Surgery Techniques | Munish C. Gupta, M.D. Dr. Gupta, Dr. Alexander Vaccaro and Sachin Gupta have co-edited a book that presents several cases using the latest techniques for spinal surgery. Their goal is to share complex procedures and the outcomes, both successful and unsuccessful, to promote the sharing of knowledge and experience in the world of spinal surgery. They plan to publish additional collections in the future, to keep up with changing and emerging techniques. More than 40 surgeons have contributed case details for surgeries to correct early onset scoliosis, pediatric spinal deformity, adult spinal deformity, trauma and tumors, and cervical spine disorders. Each case is presented in a less-formal style to make reading easier, and includes more than 500 photos and illustrations. The book is available for purchase on Amazon.com.